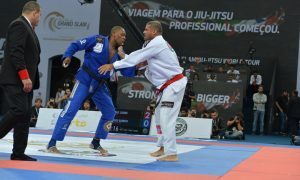 London – After four successful events that exceeded expectations in Tokyo [Japan], Los Angeles [USA], Rio de Janeiro [Brazil] and Abu Dhabi [UAE], the UAE Jiu-Jitsu Federation is looking to close the third season of the Abu Dhabi Grand Slam JIu-Jitsu world tour in style, with it’s fifth and final leg to be hosted, at the Copper Box Arena in London, UK on 10th and 11th March 2018. “To bring the Abu Dhabi Grand Slam brand to London once again for the final leg of the tour is really great, it is a special city. We have seen the sport of jiu-jitsu grow steadily over the past few years in London, for example we are expecting the highest number of British players compared to the past two seasons. The weigh-ins for all the players competing at the Abu Dhabi Grand Slam, London will take place on Friday 9th March [17:00pm to 19:00pm], Saturday 10th March [8:00am to 10:00am] at the Copper Box Arena.